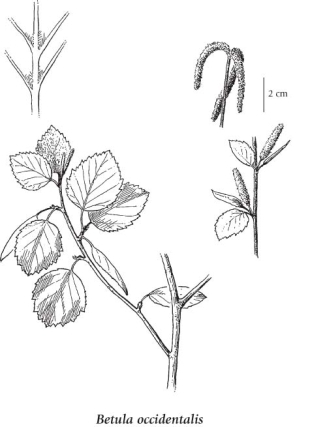 Deciduous small tree or large shrub, 3-10 m tall; bark dark reddish-brown to black. Alternate, deciduous, rounded to sharp-pointed at the tip, usually doubly saw-toothed, thin and membranous, 1-7 cm long, leaf stalks more than 1 cm long. Nutlets with broad wings, at least twice as wide as the nutlets; bracts with pointed, lateral lobes. Wet to moist streambanks, forests and marshes in the steppe and montane zones; frequent in S BC east of the Coast-Cascade Mountains, rare northward; N to AK, YT and NT, E to NF, and S to CO, UT and CA. Water birch is a small, shrubby birch found [particularly] in the southern interior of British Columbia and is distinguished from paper birch by its smaller size and by the presence of wartlike glands on its twigs. The leaves are roughly heart shaped with small teeth along the margins. In the cut-leaf mutant, found near Revelstoke, the developmet of the leaf is limited to narrow regions along some of the main veins so that the leaves look like mere skelteons of normal leaves. Extracted from Griffiths and Ganders, 1983. Wildflower Genetics: A Field Guide for British Columbia and the Pacific Northwest.